The Claws of Axos is a story that divides fans. You will either like it, or you won't. Personally, I like it but the psychedelic feel that the whole thing has will put off some viewers. But you need to watch it to enjoy it. Unfortunately it often gets overlooked but it demonstrates everything that made those early seventies stories memorable. In principle, this story isn't bad. An alien spaceship crashes in Southern England near a power plant. Members of the government meet with the aliens, the Axons, who offer the humans a new mineral. Axonite makes anything grow, the humans can see it as a way of wiping out starvation as it can make food bigger and there will be more going around. In return for the use of Axonite, the aliens want to refuel their spaceship and then they will leave. The Axons are actually parasites who use Axonite to steal a planets energies and minerals before they move on to the next planet. 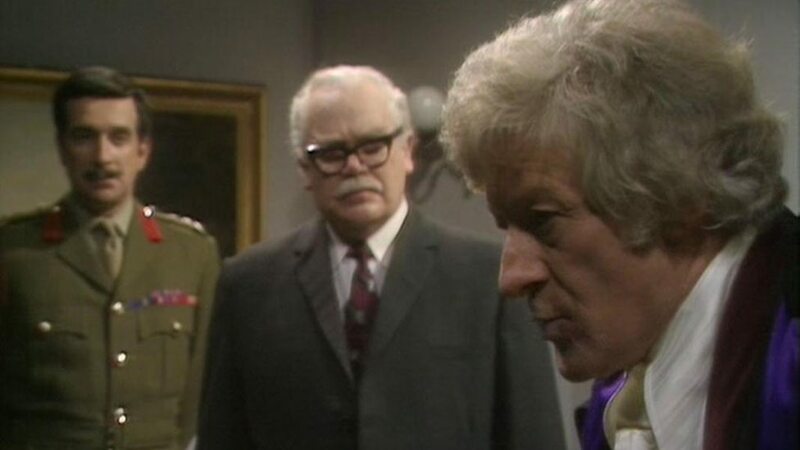 And, appearing again as he did in every episode of the 1971 series, the Master appears to be helping them while a member of the American government wants to arrest the villainous Time Lord. In theory, it all should have worked. In practice however, that is another matter entirely. First, I must talk about the irritating character of Mr. Chinn. He is a British Civil Servant who wants to claim Axonite for Britain. Actor, Peter Bathurst, had a good job as a comedic actor in shows he had been in previously. Here however, he isn't all that good. Mainly, because he is an actor who isn't suited to the show. And his role in the story is all kinds of wrong. 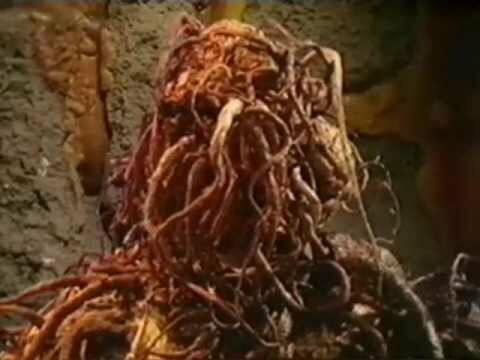 As people are running around getting electrocuted by the Axons, he wanders into the control room of the power plant with a piece of chicken in his hand having spent half the story in the canteen. And the character of Bill Filer, the All-American-Action-Hero, is wrong for the show. In reality, the actor, Paul Grist, isn't even American or Canadian. He is listed on various websites as a Welsh actor based in the UK in the sixties and seventies. Despite his accent in this story, when you find out he isn't even of the nationality he is supposed to be playing, it is hard not to feel cheated. The whole idea of having a character from a different country was to make the show easier to sell in various countries like America. But he isn't convincing or likable. And while we, the audience, are supposed to feel sympathy for him, I for one, certainly didn't. But it is actor, David Savile who is poorly treated here. 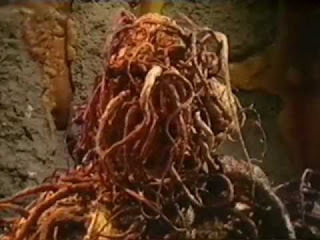 He did a great job as Lt. Carstairs in The War Games but somewhere he had obviously forgotten to act. His acting feels forced and decidedly clumsy as he tries to be authoritarian but arrogant at the same time. It doesn't work. And despite his brilliant job in The War Games, you can't help but cheer when he is killed off. Perhaps the problems with the characters doesn't come solely from the actors but from the script itself. Making their Doctor Who debuts here are authors, Bob Baker and Dave Martin. Unfortunately, with hindsight, none of their stories are particularly good. They aren't bad but they are probably the weakest stories of whichever series they are found in. The main problem with the story is that it just jumps right in. Usually, I like this and can't stand all the faffing about before hand. But here it feels like we have missed something important. Some people have compared this story to something we would find in a comic strip. And that is actually not a bad comparison. The issues on the character front is that there are just too damn many and we aren't given a reason to care about any of them. And the inclusion of the Master doesn't make a lot of sense either. He is just there, and there is no explanation as to why, given that, at the end of the previous adventure, he got the mechanism that allowed him to travel in his TARDIS back. And as for the tramp character in the opening scenes of the first episode. What was his deal? He works as a comedic element to the opening episode but did we really need him? All he does is end up dead. A problem that people have with the early years of the show is that the sets used to wobble. Usually they don't, people just make that up as an excuse to throw hate onto the programme but here I have to concede. The sets aren't bad, they just look too organic. A little too organic if you ask me. What were the designers thinking when they made the outside of the ship? Had they read Fifty Shades of Grey, about 30+ years too early? It looks like a piece of the male anatomy. Another problem with the aliens is the costumes. In their real form, they look great, something really alien, we believe that they are from another planet. But in their human forms? They look like a bunch of actors in matching unitards whose faces have been painted gold and have half a pin-pong ball on each eye. The inside of the spaceship fairs a little better than the outside but the eye thing that dangles from the ceiling looks wrong again. It looks like another piece of the male anatomy. Where the designers having a laugh? And then there is the direction. Michael Fergusson doesn't really do too much of a good job. He has an irritating habit of switching between cameras too quickly or suddenly and it makes the whole thing hard to watch. And it ruins a story that already doesn't have a lot going for it. Fergusson gave us some good stories like, The War Machines, The Seeds of Death and The Ambassadors of Death. But here it feels like he didn't just drop the ball, he let it roll down a hill and into a river, which then swept the ball out to sea and he lost all hope of ever getting it back. But it isn't all bad. Roger Delgado does another good job as the Master and Jon Pertwee and Katy Manning continue to shine. I feel sorry for Manning who had to endure an entire location shoot, out on a beach in Dungeness at the beginning of January in a mini-skirt. Delgado does a particularly good job in those scenes between UNIT and the Doctor. Luckily, at some-point during the third episode, the story seems to slow down to a better pace but considering that this is nearly the end of the story, it seems too little too late. But the cliff-hangers somehow work in making you want to see what happens next. With a plot that should have worked, it is a great shame that this is a story where the bad outweighs the good.